It’s been a few weeks since the “David Quinn Era” ended on Commonwealth Avenue and the Terriers are still without a head coach. Obviously, there are some rumors going around about who is in the running and who is not in consideration for the job. Current Boston Bruins’ assistant coach Joe Sacco had been linked to the job, but according to Mike McMahon of College Hockey News, he is no longer pursuing the gig. Also, told that Joe Sacco is no longer pursuing the job. Current Union College coach Rick Bennett had been rumored to be in consideration, but per Jeff Cox, he is staying at Union. It would have been interesting to see how the BU faithful would have reacted to a coach coming from outside. According to multiple sources Rick Bennett is staying at Union. Believe BU job will come down to Shawn McEachern and Albie O’Connell who recently had a second interview. BU hockey alums/donors would have been very upset if hire was from outside the Terrier family. Cox also outlined Shawn McEachern and current BU associate head coach Albie O’Connell as the front-runners, so let’s take a closer look at them. We would like to preface this by saying this is an unconfirmed candiates list and that this is just what we have heard on the rumor mill. McEachern is currently the head coach at The Rivers School in Weston, a position he has held since the 2010-11 season. Prior to his current position, he was an assistant coach at both Northeastern University and UMass Lowell. McEachern skated three years for BU and is sixth all-time in points (186), eigth in points (107) and ninth in goals (79). After his time wearing the scarlet and white, he spent 13 years in the NHL and scored 579 points. He won a Stanley Cup with the Pittsburg Penguins in 1992. O’Connell is currently an assosicate head coach on BU, a post he has held since since the 2015-2016 season. Prior to joining the Terriers’ coaching staff, he spent time as an assistant coach for Colby College, Niarga University, College of the Holy Cross, Merrimack College, Northeastern University and Harvard University. O’Connell is also recognized as one of the top recruiters in the county. 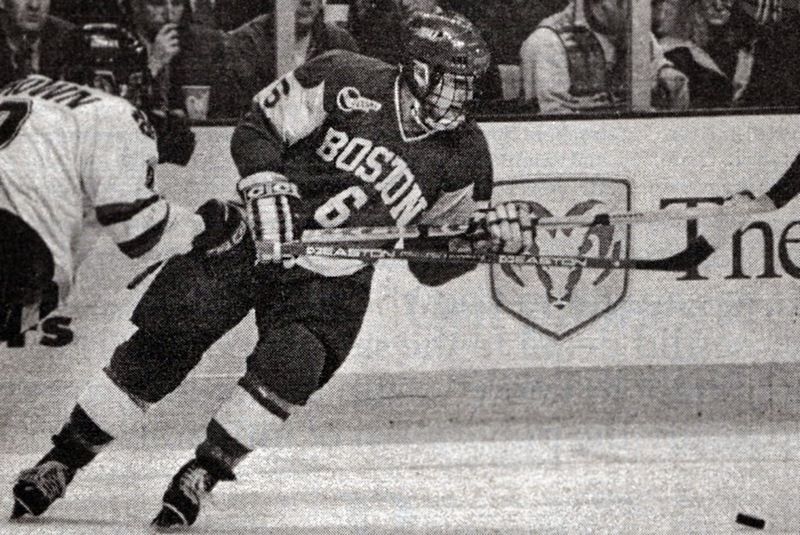 In his four years playing for BU, O’Connell won four Beanpots and scored 108 points. He captined the 1998-99 team for BU. In addition to those names, McMahon has also listed the following as being linked to the position. Steve Greenely currently is the Buffalo Sabers Assistant General Manager but he is not a stranger to coaching at BU. Greeley left his position as an assitant coach for Quinn’s Terriers after the 2014-25 season to take a job in player personal for the New York Rangers. Greeley has been linked to NHL GM postions, so it seems unlikely that he will get the position. The former Terrier captian is currently an assitant coach for the Bruins. Pandolfo played for BU from 1992-96, highlighed by a Nationa Championship in 1995. His winning ways followed him the the NHL where he won two championships with the New Jersey Devils. Pandolfo has only been an asstiant coach for two seasons and has the smallest coaching resume of any of the candiates listed here. I had the chance late last week to chat with departing BU associate head coach Steve Greeley about his time at BU and what the future has in store for him. You can read that article here. championships during his tenure with the Terriers from 1995-99. After more than a decade away, Albie O’Connell has finally returned to Commonwealth Avenue. The former Boston University men’s hockey team captain joined the Terriers in April as an assistant coach for the 2014-15 season, completing a full-circle move for O’Connell, who is once again affiliated with the same program that he played for almost 20 years ago. O’Connell joined the Terriers during the 1995-96 season as a heralded recruit. Over a year before his arrival at BU, the Watertown native was selected by the New York Islanders in the fifth round of the 1994 NHL Draft. Playing a key role on a BU squad filled with NHL talent such as Chris Drury, Shawn Bates and Tom Poti, O’Connell and the Terriers established one of the greatest stretches in program history in the late 1990s, posting a 97-41-14 record from 1995-99. While there were many positive takeaways to choose from for O’Connell, his fondest memory of playing for the Terriers was the team’s success in the annual Beanpot tournament. O’Connell and other members of the Class of 1999 are one of only four classes in program history to win four Beanpot titles. Even though O’Connell was never able to capture an NCAA title, he made two Frozen Four appearances with BU in both 1996 and 1997 – including a loss to the University of North Dakota in the 1997 championship game, 4-2. Captaining the team during his final campaign in 1998-99, O’Connell led his squad in scoring with 39 points (nine goals, 30 assists) in 36 games. By the end of his career with the Terriers, O’Connell acknowledged that learning under longtime BU head coach Jack Parker helped him grow as a hockey player in multiple areas – mostly due to the completive tone that Parker established from the get-go with his teams. While O’Connell may have turned in his scarlet and white sweater in 1999, he did not hang up his skates following his departure from Walter Brown Arena. O’Connell later played professional hockey for four teams in both the East Coast Hockey League and the British National League from 1999-02, compiling 132 points (54 goals, 78 assists) in 127 pro tilts. Once he put a close to his playing career, O’Connell immediately made the transition from the ice to behind the bench, serving as an assistant coach at Berkshire Prep School in Sheffield during the 2002-03 season before making the move up to the collegiate level the following year at Colby College. After stints at both Niagara University and College of the Holy Cross, O’Connell entered into the Hockey East coaching ranks in 2007-08 as an assistant coach at Merrimack College before serving the same role over the last six seasons with both Northeastern University (2008-11) and Harvard University (2011-14). Throughout his coaching career, O’Connell has garnered praise for his recruiting skills. During his time at Northeastern, the Huskies received commitments from both standout Providence goaltender Jon Gilles and 2014 Hobey Baker Award recipient and former Boston College forward Johnny Gaudreau. Both players later de-committed from the program. For O’Connell, the key to his success in terms of identifying talent is to trust his instincts and to collaborate with the rest of his staff. “Just going out there and working hard,” O’Connell said. “Using your resources, using what you see and not listening to anyone and trusting what you’re looking at and what your staff is looking at and what you’re trying to do as a group – that’s the biggest thing. While he has excelled at building up multiple teams, O’Connell is certainly no slouch when it comes to instructing his players on the ice. During his first season with the Crimson in 2011-12, O’Connell helped establish the country’s most potent power-play unit, which posted a 27.3 percent success rate. While the duty of serving as both a recruiter and a mentor has its own set of challenges, O’Connell holds both jobs in equally high esteem. The journey back to his alma mater has been a long and winding road for O’Connell, but the 38-year-old coach doesn’t have much time to reflect. With an influx of freshmen already training at Agganis Arena and the season opener almost a month away, O’Connell is diverting all of his energy toward helping a talented group of players achieve the same level of success that he attained almost two decades ago. Boston University issued a release Wednesday afternoon to name former Terrier Steve Greeley the associate head coach of the BU men’s hockey team. Greeley, who played four years under Jack Parker from 2000 to 2004, has worked as a scout for the Los Angeles Kings the last seven years. For more on Greeley, read our article from last week. When Steve Greeley starts as the Boston University men’s hockey team’s assistant coach Monday, there will be one unofficial order of business that will need taking care of: getting his family some new apparel. Greeley’s wife, Lauren, is a Boston College graduate, and his sister, Megan, is a rising sophomore. His father, also named Steve, coaches BC’s club hockey team. Needless to say, the new coach and member of BU’s Class of 2004 is looking for a lot less maroon and gold in their wardrobes. Whether or not the others are ready to move their allegiances down Comm. Ave., Greeley is starting his new gig July 1, just days after formally accepting the job Wednesday night, he told The Daily Free Press Thursday afternoon. After playing for four years under Jack Parker, during which time the Terriers won two Beanpot championships and made two NCAA tournament appearances, Greeley spent a season in the ECHL. He has worked for the Los Angeles Kings for the last six years, first as a college scout and more recently as a pro scout. When head coach David Quinn sought permission from the Kings in late April to talk to Greeley, then reached out to Greeley himself, things came together pretty quickly. Although he will hold a slightly different title — assistant coach, not associate head coach — Greeley is in effect replacing Mike Bavis, who resigned in the spring after spending 15 seasons on the Terrier coaching staff. Greeley confirmed assistant coach Buddy Powers will also return. “Mike Bavis is a great friend of mine, and I’ve had some great conversations with him as well about the job and about the school and everything,” Greeley said. Recruiting will be one of Greeley’s main tasks, and he’s not wasting any time. At 6 p.m. Monday, he is flying to Buffalo, N.Y. to watch the U.S. Youth Select 17 development camp in Williamsville. While Greeley doesn’t have experience recruiting youngsters to a college program, he doesn’t expect too much of a learning curve. He spent the beginning of his tenure with the Kings “recruiting” college free agents to Los Angeles, and he said the two tasks are comparable. With the Kings, he had to sell the organization — including player development, facilities and the coaches — to college players looking to go pro, a goal similar to what he’ll be doing with BU. Greeley will have plenty of adjusting to do in the coming months — adjusting to the travel, his Agganis Arena office, his family’s conversion — but he is excited, to say the least, about the new opportunity.